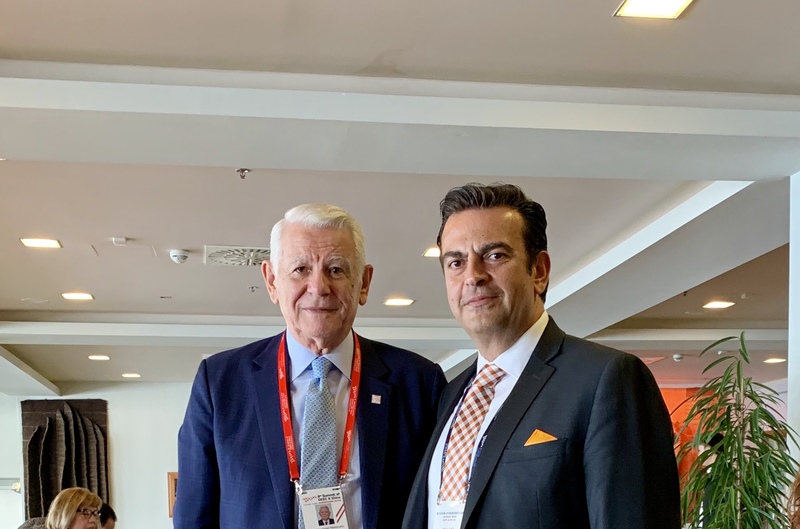 In his exclusive interview with IBNA, Minister of Foreign Affairs Teodor Meleşcanu states his gratefulness for the effort of Greece and North Macedonia to reach the Prespes Agreement. The Prespes Agreement is a very good example for the other countries of the Balkans. A lesson indicating that if there is will, any differences can be resolved, the Romanian Foreign Minister pointed out. On the sidelines of the Summit between the People’s Republic of China and the Central and Eastern European countries in Dubrovnik, Teodor Meleşcanu also spoke to IBNA on the importance of the 16 + 1 initiative, its enlargement with Greece, but also the Romanian Presidency and the Western Balkans. Minister, we are here at the Central & Eastern European countries and China Summit. You participate as a member of this group and you also hold the presidency. Please tell us more about the summit and the cooperation with China; is it good for Europe or is it a strategic enemy to the European side? You know, in reality, China is one of the big competitors of the EU in the economic field. From this point of view we are very interested in finding a kind of strategic relationship between the EU and China, in order to open the markets, to offer us the possibility to be there, to have an agreement on investment, which has to be very transparent and so on and so forth. This is a real problem and we are concentrating on it at the level of the EU. From the security point of view, I don’t see any problems with China. Of course they have their own initiative, One Belt One Road. It is a country which needs imports of energy and food. It is a country which is interested to export the goods manufactured in China. That is why for them, reliance on land and seas is very, very important. There is a very important signal at this meeting here in Dubrovnik. The decision of Greece to join the 16-17 +1 is OK. But from our point of view it is very good for the EU countries to be more representatives at the level of this format of 16 +1. From this point of view I think it was a very interesting discussion and the main objective of the meeting here was how to support SMEs. The kind of special digital system put into force here today and it is offering the possibility of networking between SMEs from China and the 16+1. Because there are many other projects on this issue and one of the most important statements of the Chinese delegation of the PM of China was a very clear signal that they are interested in developing the economic ties between the 16+1. But he underlined, with a full respect of the norms and rules of the EU. This signal for us is a very important signal and we believe in the possibility to really develop this relationship with China in the years to come. As you are hosting the EU presidency, please tell me the progress of the presidency. I know that you are in a very difficult position because of the European elections. A lot of matters are going back. Tell me, are you satisfied? I think, honestly, our presidency was excellent. I am not speaking about the administrative arrangements, the organization which was very good. We are a country which is very friendly from all the points of view. But what is interesting is the fact that we really managed to overcome all the difficulties and try and succeed to conclude all the 90 files at the EU level. I am not speaking about the, let’s say, easy files. Like the EU gas directive, the rights of property, etc. That’s why I am very happy. For us it was a real success because we never tried during our presidency to push our interests. We tried also, always with our colleagues, to find the best solution which is acceptable for all the countries. And we practically played the role of an honest broker, trying to find consensus, to encourage EU countries to arrive at some solutions and good results. There was also support from the European Parliament, I have to recognize that there was a pressure for them to conclude as quickly as possible, as many as possible files. Because you know that at the end of May we have elections and all the MEPs were very involved in the electoral campaign. This is why I think we did a good job, we have also some chances and some support from the European Parliament and we are very happy to conclude it in a very positive manner. As a part of the Balkans, do you believe in the EU enlargement in the Balkans, the Western Balkans? And how will cooperation between Balkan countries help their goals?